As you write your plan, keep in mind who you are writing your plan for. Just remember to write your plan in a clear, concise, and logical manner, so it will be easy to read. By doing it in this manner, the recipient will be able to understand clearly the business and the direction the business is going. In order to write a good business plan, go to http://greatbusinessplans.com/business-plan-template where you are taken step-by-step through the process of developing a business plan.How to Create an Operational Plan The operational plan tells those who read it how you are going to get your product/service out to the marketplace. Basically, the operational plan will answer some very important questions such as: • Who is doing what in the business?• What is performed on a daily basis?• Who will be the vendors and suppliers?• Will the company use employees or contractors?• What materials or equipment are used?Creating an operational plan is very important because it will outline to those reading it, what the company is about, what it will do, and how the people working for the company will carry out their duties, to get the product to market. Many businesses fail because the fundamentals that guide a business from start to finish is not carried out. The fundamentals I am speaking about here are the core of your business. This is what is included in the operational plan. When creating your operational plan, you need to make it detailed and in-depth. By making it so clear and detailed, you are able to follow the plan more carefully. Make sure when writing your operational plan, you do not just copy a plan from another business or take shortcuts. Every business is different. Not all businesses require the same level of complexity when it comes to the operational plan. Depending on your type of business, there may be information you just may not cover, since it doesn’t apply. If that is the case, only include what does apply. As a company, you do not want to receive complaints from your customers. As such, you may want to build sufficient flexibility into your policies so if any problems do occur, you can handle them. All of this is part of your operational plan. By planning ahead before writing your operational plan, you will find know what is best to write. In this way, you will have a plan that will be focused on what your business will do from day-to-day. Hopefully this will result in increased profits for you. 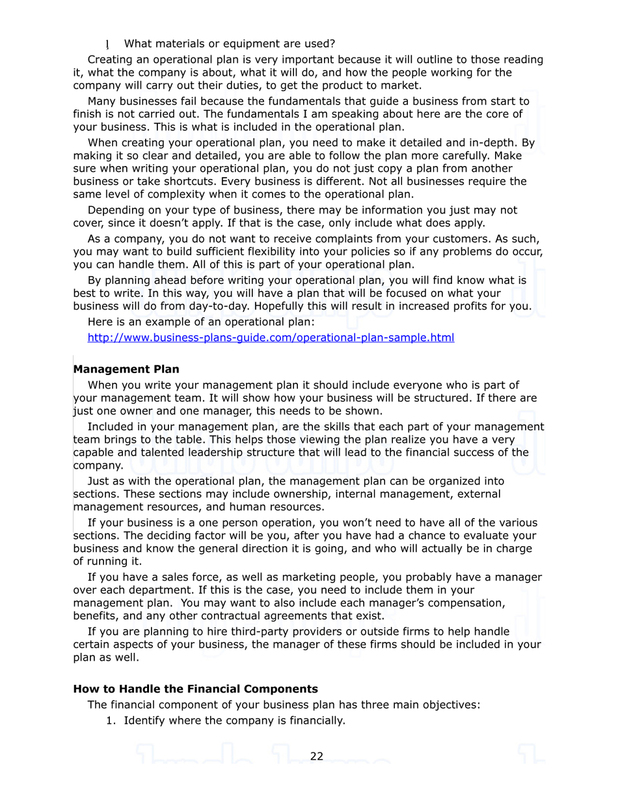 Here is an example of an operational plan:http://www.business-plans-guide.com/operational-plan-sample.htmlManagement PlanWhen you write your management plan it should include everyone who is part of your management team. It will show how your business will be structured. If there are just one owner and one manager, this needs to be shown. Included in your management plan, are the skills that each part of your management team brings to the table. This helps those viewing the plan realize you have a very capable and talented leadership structure that will lead to the financial success of the company.